Try it in a Nocturno:Combine 50ml Bacardí Carta Negra rum and 25ml coffee liqueur in a tumbler filled with ice. Cut a round piece of orange peel at least an inch in diameter. Hold a lit match just above the tumbler, then hold the peel (skin-side down) above the match and squeeze the peel over the flame. Drop the twist into the tumbler. Try it in a Fireman:Fill a shaker with ice. Pour in 40ml Captain Morgan The Original Rum, 20ml lime juice, 10ml Grenadine and ½ egg white*. Shake, then strain into a tall glass filled with ice. Garnish with a wedge of lime. 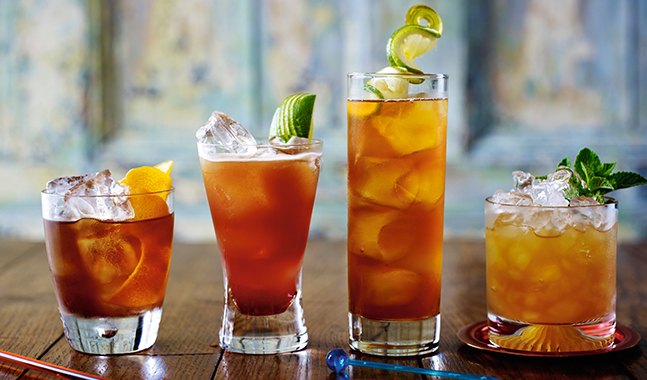 Try it in a Dark 'n Stormy®:Combine 50ml Gosling’s Black Seal Rum and 100ml ginger beer in a tall glass filled with ice. Garnish with a wedge of lime. Try it in a Fat Sailor:Shake together 50ml Lamb’s Navy Rum, 12 mint leaves, 25ml lime juice and 12.5ml sugar syrup. Strain into a large tumbler full of ice, then garnish with a sprig of fresh mint.